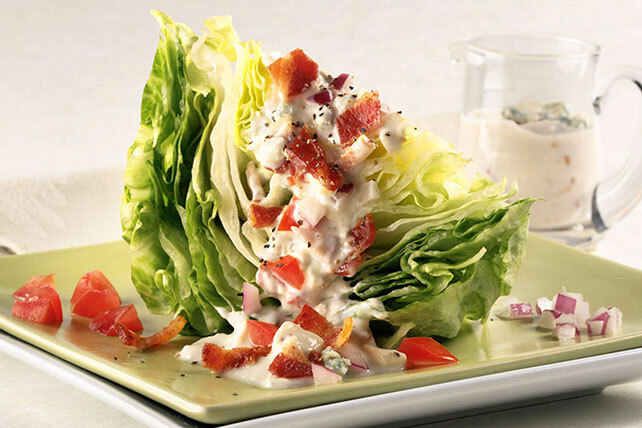 Try a supper club favorite of Wedge Salad with Blue Cheese and Bacon! Nothing beats crispy wedges topped with creamy, smoky dressing and bacon. Make this Wedge Salad with Blue Cheese and Bacon next time you need some crunch! Mix mayo, buttermilk and vinegar in medium bowl; stir in cheese and half the bacon. Place 1 lettuce wedge on each of 4 plates; top with mayo mixture, tomatoes, onions and remaining bacon. To save time, cook bacon in the microwave as directed on package.